I finally am able to post about this quilt I finished about 3 weeks ago. I finished it the night before I was going to see the recipient so it was dark. I waited to take a picture of it until I got to my parents house. I had forgotten my camera so I used theirs. I didn’t upload them right away, and when I left that Sunday, I forgot I had to do it. So the next weekend I had to go up to my parents’ again for another event, and that time, no one could find the camera. It turns out that my mom left it in my aunt’s car. So, THIS weekend, I had to meet my mom up in Lafayette to switch cars (my car got a flat the last time I was up there and so I had been driving my mom’s car so I could get back to indianapolis and go to work while it was getting fixed). She finally remembered the camera, so now I am able to share these pictures with you. I think this is my favorite quilt that I have made so far. It came together pretty quickly, and I had a good time quilting it. I even tried to quilt Audrey’s name into the quilt. Its hard to see in the picture, but you can read it in person. It looks like 3rd grade cursive! But I am sure I’ll get a steadier hand the more I practice. I'm probably the only one who can read it in this picture! 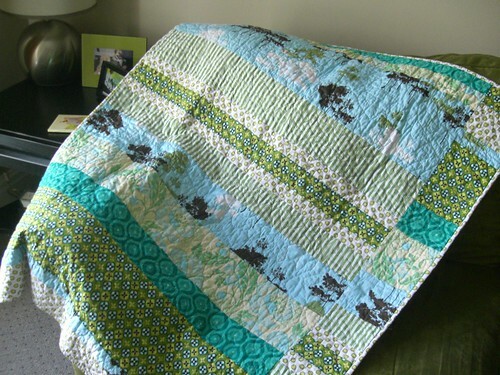 This is also the first quilt that I have gotten tons of comments on, so it must have made quite an impression on people. I gave it to Audrey at my cousin’s bridal shower because I wasn’t able to go to her 1st birthday party. So now I have a waitlist of people in my family who want me to do a quilt for them! It makes me happy though, I’m doing something people appreciate. That makes me feel good. This is the start to the wedding gift for my cousin who requested something “maroon”. 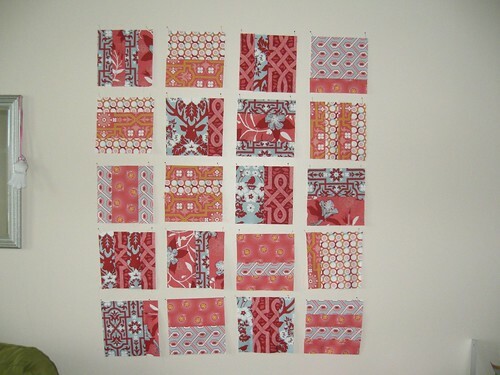 I’m using the persimmon colorway of Joel Dewberry’s Deer Valley line and Oh Fransson’s mixtape quilt tutorial. I am really like how this arrangement really shows off the fabrics. I am using a neutral (not white!) 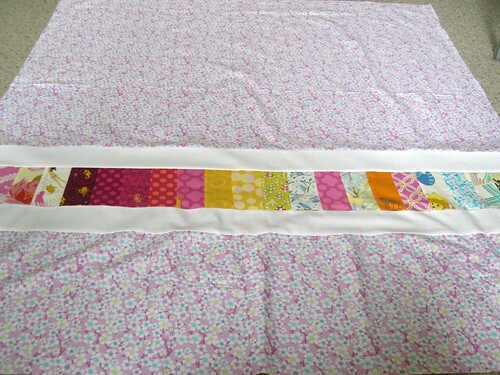 sashing, and I think it really brings everything together. I’m excited to finish this top. Its outside my normal color choices, so it has been a fun challenge trying to get it all to work. I pinned the blocks up to keep them in order, and also to give me some perspective, it really helps! My “design wall” is actually just my living room wall, between the couch and my sewing area. 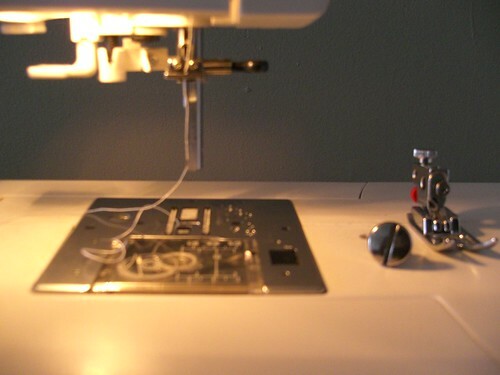 I need a bigger place to live so my sewing stuff can have its own room! It’s my friend’s daughter’s first birthday party on Saturday so I decided on the spur of the moment to make a quilt for her. Mainly because everyone was asking me what I was making for her, and all I could say was “I bought her some clothes!.” This was probably the fastest quilt I have completed so far. I started on Tuesday and was finished by Wednesday just working on it when I got home from work. Mostly because there was not a lot of cutting involved. Cutting out the pieces is not my favorite part of the process, it gets tedious and you have to pay so much attention to make sure everything is precise. 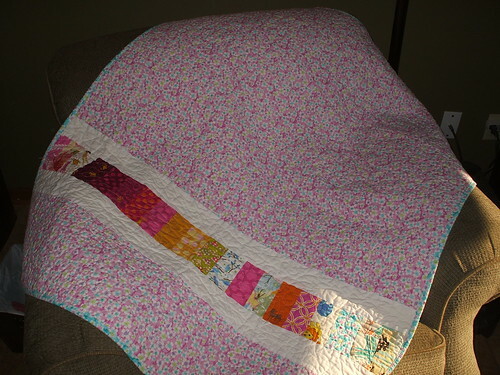 I was so tired of using pink, the last two quilts I’ve made have been mostly pink quilts, so I wanted to do something not pink, and also using only what I had in my stash. So I was looking through what I had and came across this Michael Miller Ginger Blossom fabric that I had and realized that it was mostly made up of the colors in my friend’s house. So I decided I would make a baby quilt that they could throw on the floor or over the couch and it would match its surroundings! I added in the Midwest Modern poppies, sky blue Carnaby Street fabric and Olive Rose Curves in emerald to brighten it up. 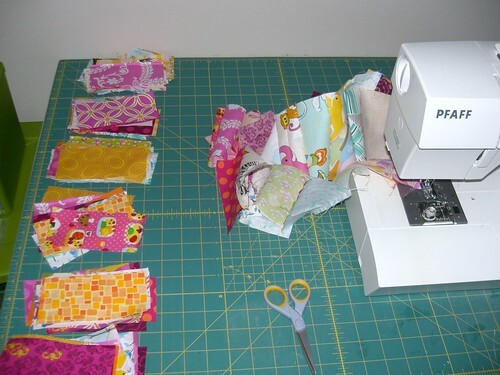 At first, like with Audrey’s quilt, I wasn’t sure if I made good decisions picking out fabrics for this quilt. I was thinking it was going to be ugly. Even when I finished the top and back, I still had my doubts. At this point I was thinking "This could quite possibly turn out to be the ugliest thing I've made so far"
But once I got the sandwich together and started quilting, I began to like it more. And once it was washed and came out of the dryer, I liked it a lot. And it goes great with my couch! If I had more of this fabric left over, I probably would have made a bigger version of this for myself! 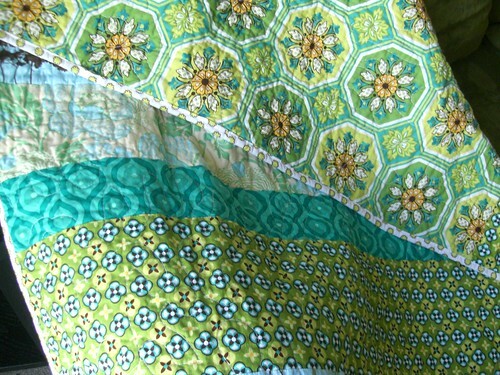 I’m glad I’ve been making these quilts lately using materials I already have. Its nice and economical when money is tight, and still makes an impressive gift! Although the next project I am working on I had to buy all new fabric for. I love getting new fabric, but sometimes its nice to just use what you have when you are feeling poor, and I am feeling poor right now. 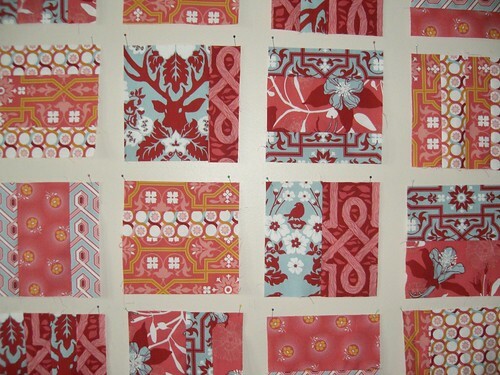 But on the brightside, I got a bunch of different prints in the Joel Dewberry Deer Valley line, and I am going to be using Oh, Fransson’s mixtape quilt pattern with it, so I think its going to turn out pretty awesome. Just waiting for the fabric to get here so I can get started! 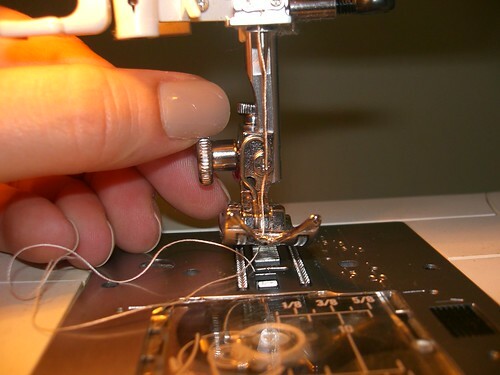 also I will mention here that the metal bar on the top of the darning foot needs to be on top of that black screw on the side that secures the needle in place. and that’s it! 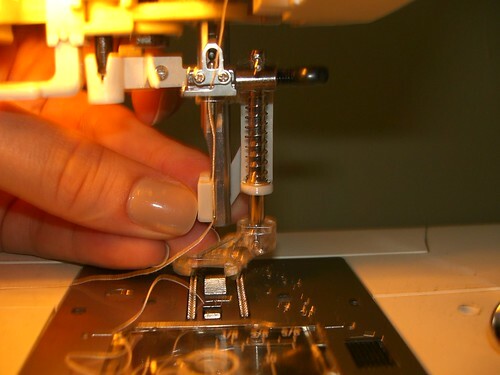 hope that helps anyone starting out with free motion quilting. 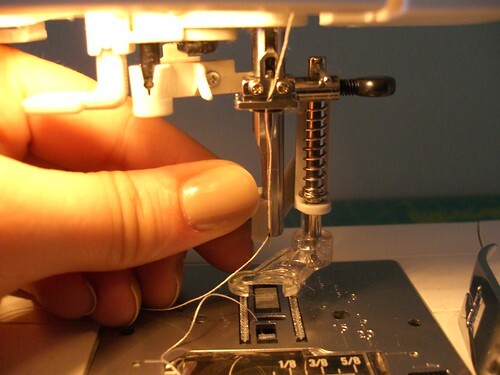 One more thing, make sure the presser foot lever is down when you start quilting! 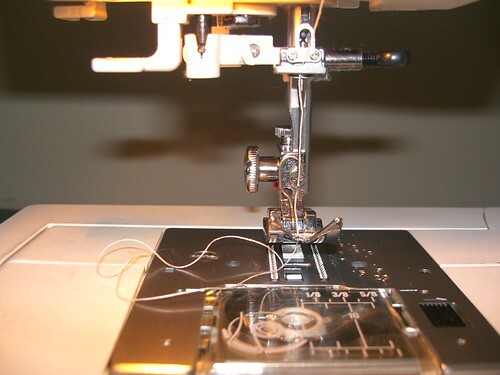 Its hard to tell if it is or not, but if its not, your quilting will be all jacked up on the back, to use a technical term and its a real pain ripping out stitches! My dog Foxy has made it to round 3 in the cutest dog competition. Would you please vote for him? We can’t thank you enough! Click on the picture to vote! 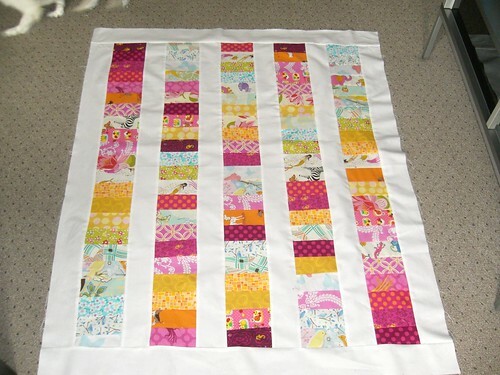 Actually, all I have left is to do the binding, yesterday I made the quilt sandwich and quilted it. 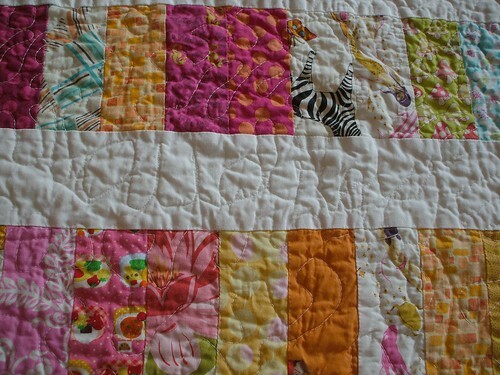 I even attempted to hide Audrey’s name in the quilting! It looks like when you first learn to write cursive, but it is legible, and I think its cute. 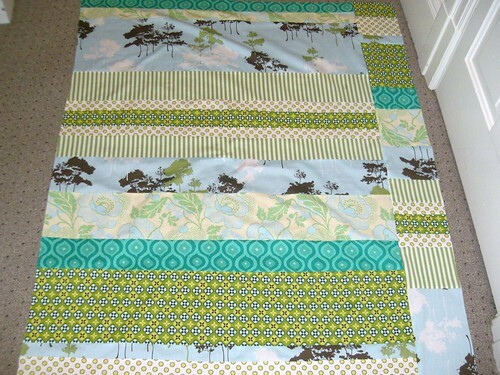 But here are the photos of the finished quilt top and back. I really like how this turned out! I used 22 different fabrics for the coins, there’s a little bit of everything in there, and the back was a yard of Michael Miller Far East Florals Blossom in peony. The finished size is about 45″x60″ . 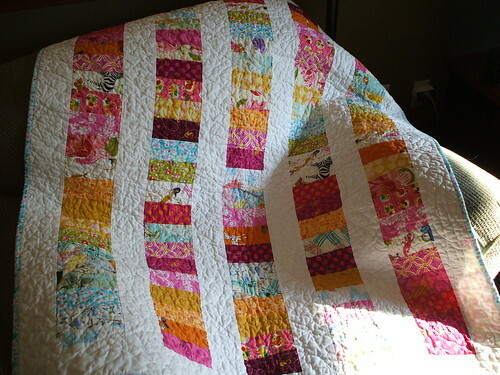 The best part about this quilt was that I did not buy anything new to make it, it was all from my stash, including the batting! I am still debating what I am going to use for the binding, it may have to be two different fabrics because I am not sure I have enough of one to go all the way around. I’ll have to figure that out tonight, because this is the last day I have time to finish this before I go up to deliver it! This is a happier project than my sad Halloween block below. 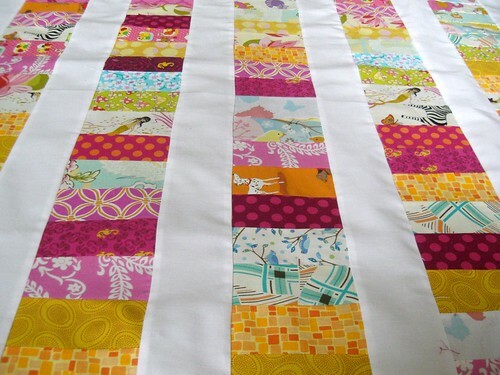 I’m making my goddaughter a quilt for her first birthday, here’s a little preview of what I got started. I actually finished up the quilt top and back last night, hopefully I will be able to take some pictures this afternoon when I get home from work. Its a stacked coin quilt, I used 22 different fabrics for the coins…mostly pinks but there’s also some orange yellow blue and green in there. I know that sounds insane…I was unsure of it myself at first…but once it came together I think it looks adorable. I’ll try and post those new pictures tonight!